Sounds a bit like a young kid’s adventure series, doesn’t it? Unfortunately, not. From the very day I brought Jezzy home from the Humane Society, she’s been terrified of storms, loud noises, blowing plastic bags, shopping carts, and (most of all) 4th of July week. She’s got at least a dozen things that terrify her. The panting, crouching, and frantic running from one of her ‘safe’ spots in the house to another are painful to witness. Holidays with fireworks are particularly awful. One summer, soon after Jezzy came to live with me (she’s now about 7), I asked my vet for some doggie downers to help her thru 4th of July week. She gave me a packet of pills. With an approaching thunderstorm one evening soon after that, I gave Jezzy about 1/2 the dose, and hoped for the best. The drugs turned her into a drooling, weak-kneed, shadow of our fuzzy pal. Needless to say, the remainder of that medication hit the trash. Since then, John and I have tried to be home when we know fireworks are likely to be exploded nearby (our neighborhood seems to have a particular love of M-80s), or when severe weather approaches. But, as each event brings new terror to Jezzy, I’m less willing to sit by and try to offer what feeble comfort we can administer. 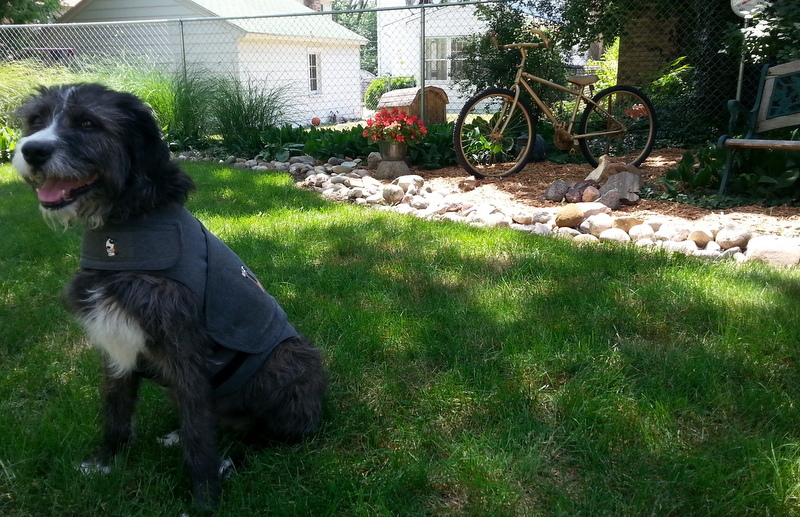 Jezzy sporting the Thundershirt. Goes on easily and snugs up nicely. Although I don’t know of anyone who personally has used one of these, ringing endorsements have come my way. It apparently applies gentle pressureWhy not try it? Thirty bucks for a bit of calm for Jezzy is a pittance. So, she and I walked over to our local pet supply warehouse, Chow Hound (I LOVE supporting local retail), and tried one on for size. Our purchase received a ringing endorsement from the couple behind us in the checkout lane. I’ll let you know how it works. This week promises to be a wild one….lots of big heat, which will probably generate late afternoon thunderstorms. It will be a good test for Jezzy’s Hell week, which begins around July 1. Not expecting anything miraculous, but a bit of relief for our best girl would be welcome, indeed. This entry was posted in dogs, pets, weather and tagged dogs, pets, weather by Judy Crankshaw. Bookmark the permalink. Poor Jezzie. I hope the gentle hug of the thundershirt helps. I used to have a cat who would hide behind the toilet during storms. He had been kept outside in a cage before and weathered the full blast of storms with no protection. It traumatized him for life. My little Sunny is just the opposite. He’s a fear barker, and thinks if he acts ferocious anything that is scaring him will go away. So he runs to the windows during thunderstorms and barks furiously at the thunder. The funny thing about Jezzy and her terror is that she still thinks she has to protect us. She must have some kind of shepherd in her makeup, because if either John or I leave the room during a storm, she will crawl out from whatever hole she’s hidden in, and come sit outside the bathroom door, or wherever we are, and wait….trembling like crazy. Then, when we come back together, she can go back into hiding. If it weren’t so sad, it would be funny. She likes the flock to be together where she can ‘protect’ us in dangerous times! July 4th hell week has been going on already for a week in Jenison. I want to call the cops. All day and late into the night. Stupid legislators and their stupid ideas!!! 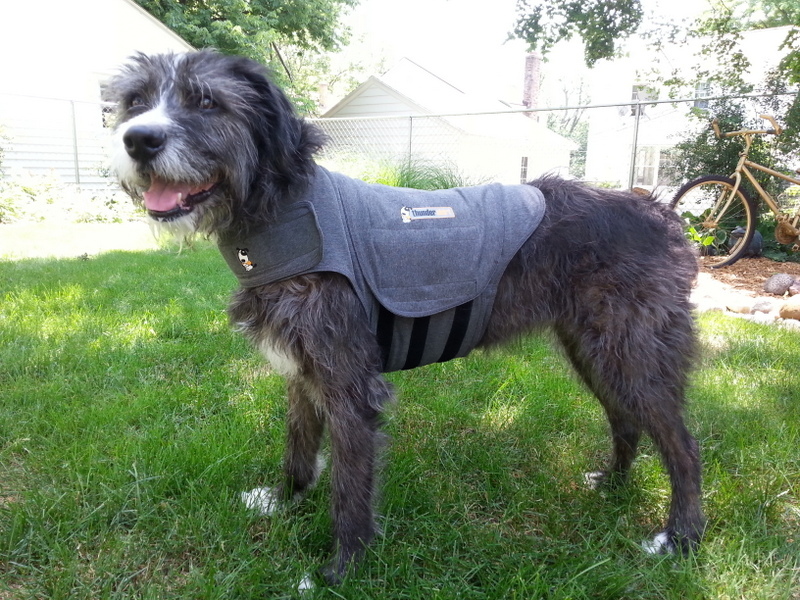 We have a Thundershirt for our Molly, and also one of our daughters has one for their dog. It has worked for us. Molly still doesn’t like storms and rockets going off, but she doesn’t have the terrified behavior. It didn’t work as well on Lisa, but they said it helped some. It is so sad when the pet you love, is so afraid. Hope it works for Jezzy. We’re hoping for just some relief for Jezzy. It’s just miserable to watch. It’s hard to find a place to hide from all the noise. Wouldn’t mind it myself, if Jezzy weren’t such a wreck.